Welcome to Day 2 of the SECRETS, SPIES & SHERLOCK BLOG TOUR, featuring two exciting new middle grade mystery series: Sherlock, Lupin & Me: The Dark Lady by Irene Adler and Secrets & Spies: Treason by Jo Macauley. Each stop on the 2-week tour will feature fun posts and a chance to win a set of finished copies of the books! Today’s post features Treason by Jo Macauley. Treason is set during a particularly tumultuous time in English history, after civil wars had led to the beheading of Charles I, allowing the militant Puritan Oliver Cromwell to rule the country for 18 years before Charles II was restored to the throne. 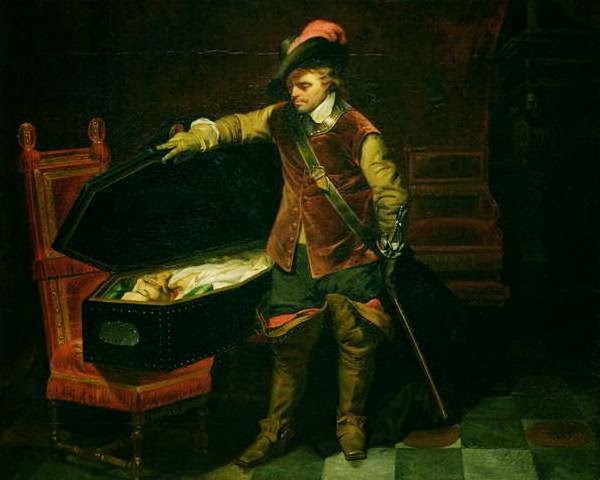 In the first year of the Restoration, Cromwell was posthumously convicted of treason, disinterred, hanged and beheaded. Since then his head has passed from hand to hand, and to this day only a handful of people in the world know where it is. In Treason, Beth Johnson, a young actress and spy, must race against the clock in this climate of fear and bloodlust to prevent the assassination of the newly reinstated King. Though the assassination plot at the heart of Treason is fictional, there were several real conspiracies raging during this time. 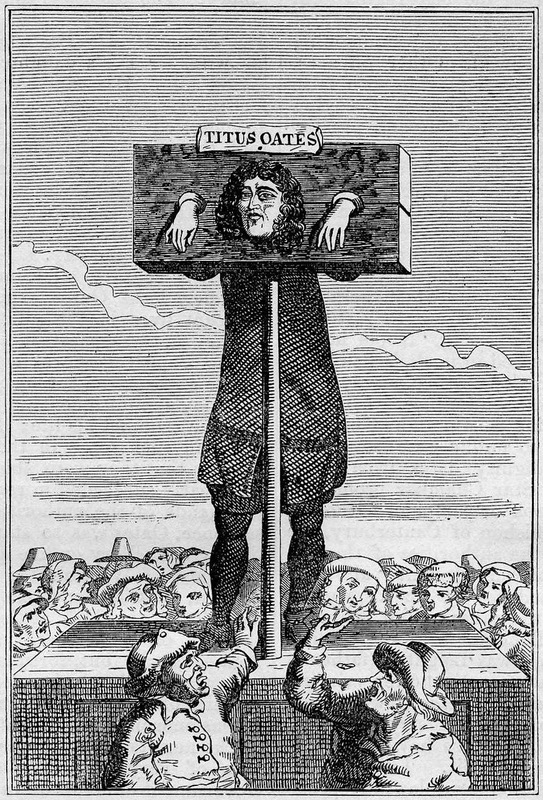 In 1678, the Popish Plot, a fake conspiracy created by Titus Oates, came about due to strong anti-Catholic feelings amongst the mostly Protestant English public. Oates accused the Catholic Church of endorsing Charles II’s assassination, and named a hundred supporters allegedly involved in the plot. Oates claimed that the plot included several possible methods of murder — ranging from stabbing to poisoning by the queen’s doctor. Eventually, the panic began to die down when no assassination attempts were made, and Oates was later tried for perjury, sentenced to life imprisonment, being whipped through London twice, and pilloried every year (otherwise known as being thrown in the stocks). To this day, no one is sure who killed Godfrey, and there is no evidence that any of the accusations made by Oates were true — the alleged Popish Plot was purely fictional, yet it was not until the early 19th century that most of the anti-Catholic laws enacted during this period were overthrown. In 1683, an actual assassination plot arose. 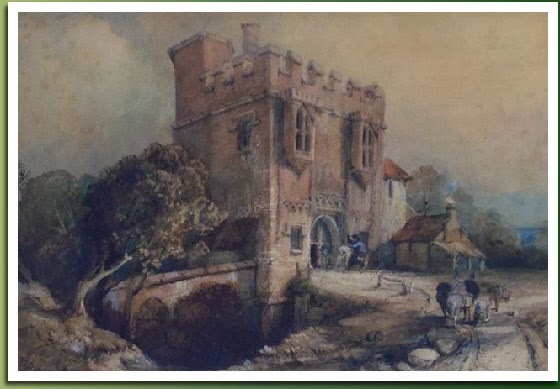 The Rye House Plot was a conspiracy to assassinate Charles II and his brother James, the heir to the throne. The Popish Plot had led to the creation of the Exclusion Bill, which would prevent James from ascending the throne after Charles, and those in opposition to the restored monarchy were planning to incite a rebellion against the King. However, Charles dissolved Parliament, leaving his opposition with no legal way to prevent James’ succession. As a result, the Rye House Plot was hatched. Rye House was a fortified medieval mansion surrounded by a moat north of London. The plot was a simple one: the leaders planned to hide a group of men in the house, and then ambush Charles and his brother as they passed by on their way back to London from the horse races. The King was expected to arrive on April 1, but a major fire cancelled the races and he made the journey early — inadvertently thwarting the plot before it could even begin. Enter below to win a copy of Treason and see if Beth and her fellow spies get off so easily when she uncovers another deadly plot against the King, as well as a copy of The Dark Lady by Irene Adler! While on summer vacation, little Irene Adler meets a young William Sherlock Holmes. The two share stories of pirates and have battles of wit while running wild on the sunny streets and rooftops. When Sherlock's friend, Lupin, joins in on the fun, they all become fast friends. But the good times end abruptly when a dead body floats ashore on the nearby beach. The young detective trio will have to put all three of their heads together to solve this mystery. Fourteen-year-old Beth Johnson is a talented and beautiful young actress. She is also a spy. The year is 1664, and Charles II is on the throne, but all is not well in the bustling city of London, and there are those who would gladly kill the king and destroy the Monarchy. One morning, a mysterious ghost ship drifts up the Thames. Sent to investigate by the King's Master of Secrets, Alan Strange, Beth quickly finds herself embroiled in a dangerous adventure. Will Beth be able to unravel the plot to kill the King before it's too late?